Can Green Tea Really Treat Your Acne? You can’t drink enough green tea to heal acne. But green tea extracts in acne creams and lotions can be an amazing anti-acne treatment for your skin. Green tea helps get rid of blemishes and reduces oil production. Green tea lotions often get better results in fighting acne that most prescription medications. Green tea helps get rid of blemishes1, usually over a period of about six weeks. Green tea helps reduce oil production and shine, especially over the cheeks. Green tea protects the skin against the DNA-damage caused by UV-A rays2 of the sun. Sun protection by green tea extracts helps prevent the formation of brown spots on the skin after acne clears up. Just because a product lists green tea as an ingredient does not make it good. The addition of irritant ingredients can cancel out the benefits of green tea. Exposed Skin Care Clearing Tonic offers green tea with the power to fight pimples, blackheads, and whiteheads—with a one-year money-back guarantee. If you treat your skin with tretinoin topical lotion, blue light therapy, red light therapy, or benzoyl peroxide, you will probably get some visible results right away. If you have multiple pimples, blackheads, and whiteheads, however, chances are that about 2/3 of them will still be on your skin a month later. Even three to six months later, you will probably still have some signs of acne, about 1/3 of the original blemishes, and it is almost unheard of for a single treatment to eliminate acne on anyone’s skin. Green tea won’t eliminate 100% of acne overnight, either. But scientists at the University of Miami3 in Florida found that a lotion containing 2% green tea extract got rid of, on average, 58.3% of lesions in just six weeks. Volunteers in the study had an average of 24 blemishes at the beginning of the study and an average of just 10 after 42 days. The way green tea works seems to be by blocking the production of sebum. Pharmacists at the School of Alternative Medicine at the Islamic University of Bahawalpur4 in Pakistan gave male volunteers a 3% green tea lotion applied to apply across the cheeks of their faces every day for 8 weeks. Using a device called a Sebumeter, the Pakistani researchers confirmed that using green tea lotions “significantly” reduced production of skin oils in this oiliest region of the face. Green tea extracts also protect the skin against damage by the sun. 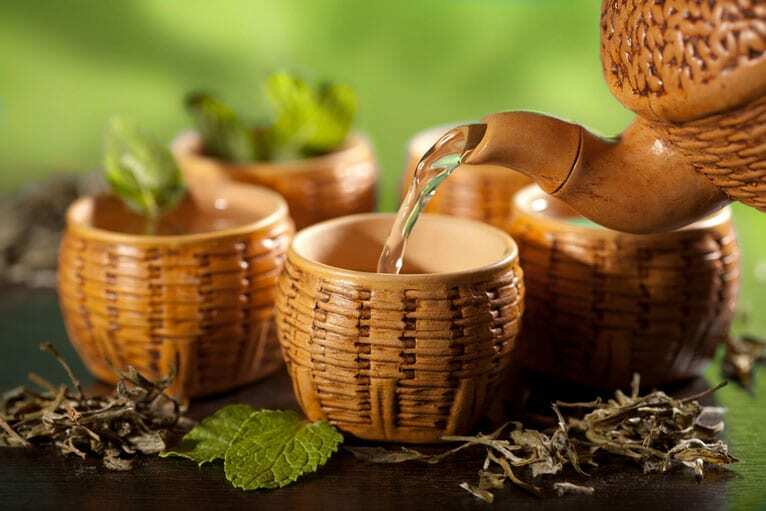 Dermatologists at several universities in the United States have studied the phenols in green tea for protecting the skin against the harmful effects of UV radiation. They have focused on finding natural products that protect the skin against the effects of UV-A rays5, wavelengths of sunlight that do about 95% of solar damage to the DNA of the skin, but which aren’t stopped by many sunscreens sold in the USA. The phenols in green tea and also in red wine, soy, mushrooms, cocoa, and grape seeds hold potential for UV-A protection without toxic side effects or discoloration of dark skin. Plant polyphenols do not prevent sun damage to the skin. Scientists have found that even when the skin is pre-treated with green tea extract, UV rays from sunlight cause immediate damage to the skin. When researchers studied skin samples 48 hours later, however, skin cells that were treated with green extracts began to repair their DNA so it would function normally. Cells that don’t get any sun protection become inflamed. Cells that get green tea do not. What does sun damage have to do with acne? If you happen to have Asian or light brown skin, the answer is, a lot. Many people whose predominant skin tones are gold or light brown say that the worst thing about acne is not the whiteheads, blackheads, and pimples. It is the brown spots on the skin left behind when acne heals. Protecting acne-prone skin from DNA damage from the sun reduces the need for the immune system to remove defective, potentially cancerous cells6 with inflammation. And when golden or brown skin is not inflamed, it does try to repair itself by producing melanin pigment that can leave age spots behind. Should You Use Green Tea for Acne? Acne-prone skin on the cheeks or forehead, where the facial skin produces the most oil. Pimple-prone Asian or Mediterranean (golden or brown) skin that tends to get spots after acne heals. Acne-prone skin of any degree of dryness or oiliness7 and any color that has been sunburned. The great advantage of solar protection of the skin with green tea extract is that it works even after the skin has been burned. It’s better to protect the skin with sunscreen, of course, but green tea can still help the skin even you use it as late as 48 hours after skin has been burned. Just because a skin care product contains green tea does not make it good. There are products that include green tea extracts with potentially harmful ingredients such as alcohol, padimate O (PABA), thickeners, emollients, SLS (sodium lauryl sulfate, also known as sodium dodecyl sulphate), rosemary, lemon oil, sage, and celandine. Generally, you want products that contain just green tea, preferably 3% green tea or more, alcohol, some kind of carrier oil, and cetearyl stearate to hold the lotion together on your skin. One excellent choice for treating acne-prone skin with green tea that is not usually advertised to acne sufferers is BeautiControl Regeneration Overnight Recovery Retinol Capsules (which retails for US $39.50 for 30 capsules, enough for 30 treatments). This product contains a large amount of green tea along with bisabolol to fight inflammation8 and retinol to stimulate the growth of healthy skin to open pores. Providing the product in a capsule form keeps the antioxidant ingredients like green tea and retinol fresh until the moment they are used—just break open a capsule on your face and begin treating acne where it is likely to be worse, just above and just below the eyes. Clinique Skin Care Acne Solutions Clearing Moisturizer contains the green tea and other antioxidants that people with Asian or brown skin need to prevent the formation of spots on their skin as acne heals. This product also contains 2.5% benzoyl peroxide, which is strong enough to kill acne bacteria9 but gentle enough not irritate the skin. This excellent product contains a tiny amount of peppermint extract, but just enough to make it smell good, not enough to irritate your skin. Nasri H., Bahmani M., Shahinfard N., Nafchi A.M., Saberianpour S., Kopaei M.R. Medicinal Plants for the Treatment of Acne Vulgaris: A Review of Recent Evidences. Jundishapur Journal of Microbiology. 2015;8(11):e25580. Katiyar S.K. Green tea prevents non-melanoma skin cancer by enhancing DNA repair. Archives of Biochemistry and Biophysics. 2011;508(2):152–158. Elsaie M.L., Abdelhamid M.F., Elsaaiee L.T., Emam H.M. The efficacy of topical 2% green tea lotion in mild-to-moderate acne vulgaris. Journal of Drugs in Dermatology. 2009;8(4):358-64. Mahmood T., Akhtar N., Khan B.A, Khan H.M.S., Saeed T. Outcomes of 3% Green Tea Emulsion on Skin Sebum Production in Male Volunteers. Bosnian Journal of Basic Medical Sciences. 2010 Aug; 10(3): 260–264. OyetakinWhite P., Tribout H., Baron E. Protective Mechanisms of Green Tea Polyphenols in Skin. Oxidative Medicine and Cellular Longevity. 2012. González Maglio D.H., Paz M.L., Leoni J. Sunlight Effects on Immune System: Is There Something Else in addition to UV-Induced Immunosuppression?. BioMed Research International. 2016. Endly D.C., Miller, R.A. Oily Skin: A review of Treatment Options. The Journal of Clinical and Aesthetic Dermatology. 2017;10(8):49–55. Sinha P., Srivastava S., Mishra N., Yadav N.P. New Perspectives on Antiacne Plant Drugs: Contribution to Modern Therapeutics. BioMed Research International. 2014. Del Rosso J.Q, section editor. What is the Role of Benzoyl Peroxide Cleansers in Acne Management?. The Journal of Clinical and Aesthetic Dermatology. 2008;1(4):48–51. Face Mask For Acne – What Are The Best Face Mask For Acne? I'm a big fan of using green tea to treat acne. I would say that it's particularly helpful for people who have a lot of excess skin oil. Studies have shown that using a 3% green tea extract cream reduces skin oil production by something like 60% after 8 weeks of use.